Located in the college town of Storrs, Connecticut, the University of Connecticut is ranked among the top 25 public research universities in the nation. Students come to UConn from different states, countries, and continents, choosing to be here not just for our rigorous academic programs but also for our richly diverse and inclusive campus. International Student Services: The Office of Global Affairs provides support for UConn’s international student population. Financial Aid: For detailed information regarding financial aid options, visit financialaid.uconn.edu. Test Score Requirements: International applicants whose primary language is not English must submit official Test of English as a Foreign Language (TOEFL) or International English Language Testing System (IELTS) scores. TOEFL or IELTS test scores can also be a valuable supplement to unsatisfactory Critical Reading SAT test scores. The minimum score requirement for the TOEFL is 550 (paper based), 213 (computer based), or 79 (internet based). The minimum score requirement for the IELTS exam is 6.5. Test scores must be sent directly to the University of Connecticut from the respective test provider. Submission of SAT or ACT scores is also required. Founded in 1881, the University of Connecticut is ranked among the top 25 public research universities in the United States. With 10 schools and colleges offering undergraduate degrees, UConn is a prestigious Tier 1 research university that provides students unparalleled accessto hands-on learning opportunities. Students learn and work alongside the top faculty in their fields, professors who are dedicated to bettering the world through their research and inspiring students throughadvising and mentorship. Located in the heart of the Northeast, UConn’s proximity to New York City and Boston makes for an energizing environment. The safe maincampus in Storrs has everything students need or want, and cafés, shops,and restaurants are just steps awayin downtown Storrs. And with one of the highest percentages of students living on campus of any public university in thenation, your friends will always bearound—days, nights, and weekends. Residence halls, suites, and apartments each have their own ammenities, from volleyball courts to makerspaces. Over 650 clubs and organizations allow students to pursue their interests outside the classroom—andthe four art galleries and five theaterson campus ensure there are plentyof options to choose from on a night off from your studies. Live in one of our residence halls, suites, or apartments and explore your passions further by joining oneof 20 Learning Communities, whereyou live and learn among peers withsimilar interests. UConn’s five cultural centers serve as a resource for the richly diverse and inclusive campus community, comprised of students from nearly 90 different countries. And if exploration is what interests you, Education Abroad’s 250 organizedadventures in over 60 countries provide experiential learning opportunities like no other. UConn’s Office of Undergraduate Research will guide you in individualized research, scholarship, and creative activity. Together you’ll findand develop opportunities to engagein independent or collaborative research with faculty across UConn’sacademic disciplines. Our nearly 20 different global institutes, centers, and programs ranging from Eurotech to the Center for InternationalBusiness Education and Research givestudents the opportunity to engage with diverse cultures, societies, andlanguages. Spirit. Pride. Tradition. 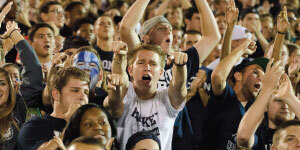 Students pastand present will tell you there’s nothing quite like the UConn community. We’re tied together by the rushof cheering for our championshipathletic teams and boundless lovefor our school. Winning is just oneof UConn’s many traditions: women’s basketball holds the longest winning streak of any college basketball team, while men’s basketball and the field hockey team are both four-time national champions. With 24 Division I athletics teams to root for, there’s no shortage of Husky pride on campus. UConn’s Center for Career Development is a resource for job preparation beginning as early as yourfirst year. Take advantage of the annual Internship Fair, designed to helpyou make connections. Meet with career consultants one-on-one to learn about your career options, orattend mock interview workshopsto sharpen your presentation skills.With over 650 companies activelyrecruiting students on campus eachyear, practice makes perfect and preparation is key. Everything you learn at UConn is designed to help you achieve yourgoals. 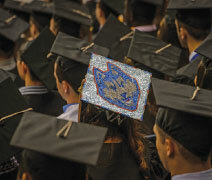 You’ll carry your UConn experience with you through friendswho become family, Husky pride thatbecomes part of your identity, and dreams that become your life. Expand your circle and join a network of 255,000 alumni worldwide. 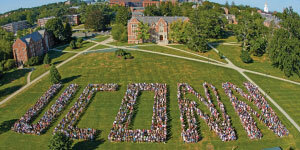 Get the most up-to-date academicrequirements as well as tuition information at admissions.uconn.edu.